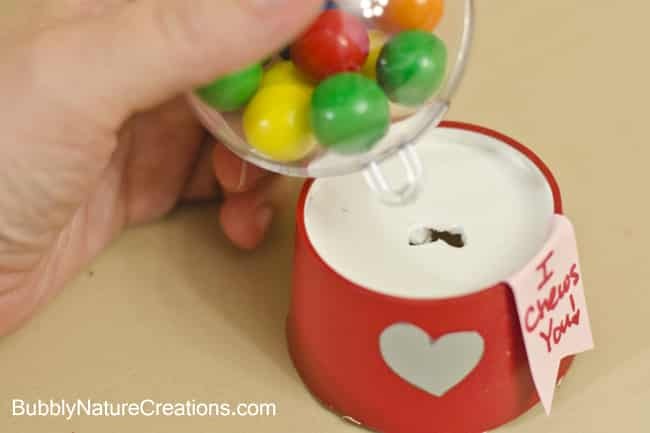 This has to be the cutest Valentine gift for kids! What kid doesn’t LOVE bubblegum? 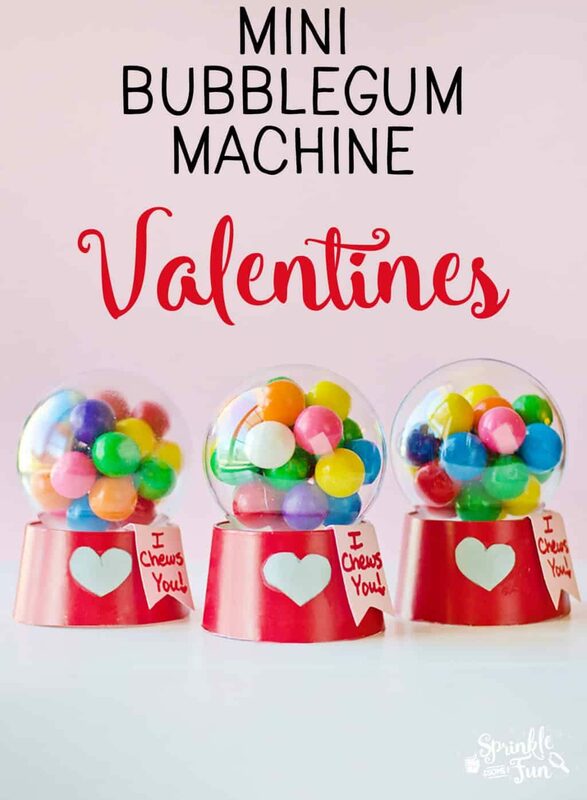 This post for Mini Bubblegum Machine Valentines contains affiliate links. Thanks so much for your support! Buying from the links helps to support this site and doesn’t cost you any extra from the retailer. 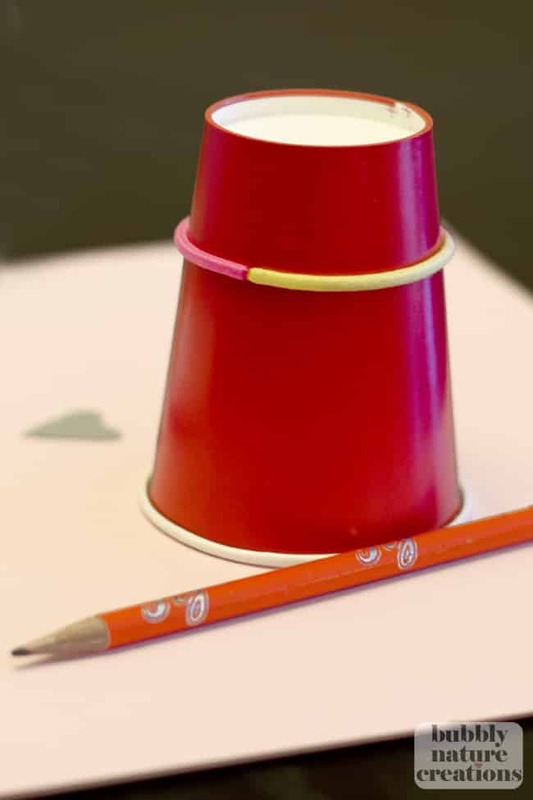 My girls and I were thinking of the perfect DIY Valentine ideas. A few things stumbled around in our heads, but we all liked the idea of using bubblegum. Bubblegum is bright, bubbly and cheerful. I thought that we should do something with the classic bubblegum machines like the ones I grew up with and this craft was born! 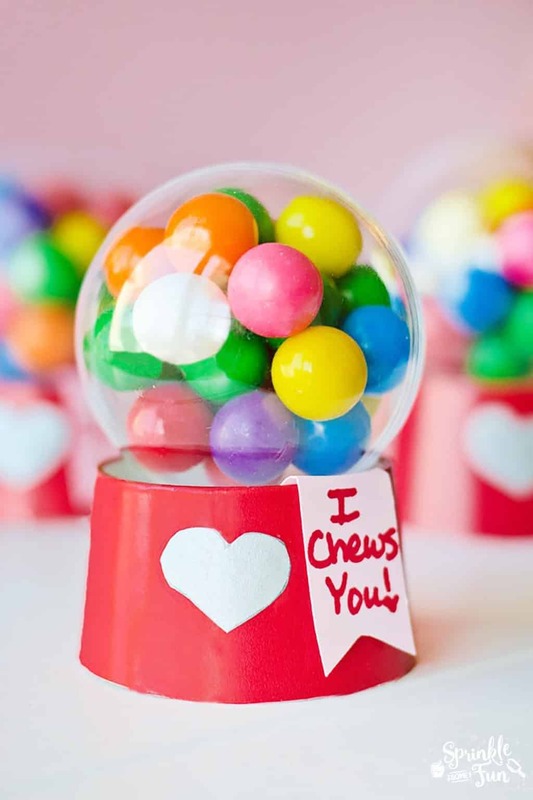 These Mini Bubblegum Machine Valentines are sure to brighten up your Valentine’s Day! We made a bunch of these and it didn’t take us very long and only requires minimal craft skills! Yay! Here is another fun idea using bubblegum: Rainbow Bubblegum Necklaces! 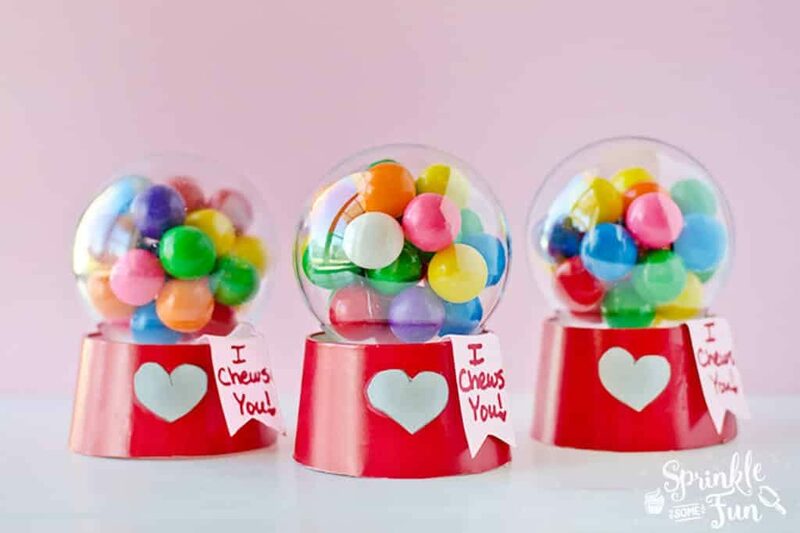 Mini Bubblegum Machine Valentine’s are a super cute gift for Valentine’s Day! The little ornaments that I bought from Hobby Lobby (not a Christmas item – they were found by the glass jars) have a ring on the top. I punched a hole with my scissors in the bottom of the cup and placed the ornament (already filled with bubblegum) inside. I taped it on the inside to secure. (If you will be passing these out I would go ahead and place some tape to the seams to to make sure they don’t fly open!) Also, if you will be transporting these then you will want to hot glue them at the bottom instead of just tape to secure. The kids should still be able to open it all up once they tear them apart of couse! The last step is to cut out a little heart in a metallic gray and a ribbon shape out of pink and wrote “I Chews You!” on it! SO fun! The cutest Valentine ever! It’s also gender-neutral! SHUT UP, these are just to darn precious for words. I love originality! GREAT JOB! xo jen sharing on my FB page. This are so stinkin cute! What a great idea! I can’t tell how those ornaments open…I don’t see a seam? Thanks, Tabby! They split right in half. I guess you can’t see the seam because of the angle I took the pics. That is a brilliant valentine! I love the homemade bubblegum machine! RAD. Wow. That is ingenious — and a great idea! I’ll have to hunt down some ornaments now (not sure if they’ll have some at this time of year! Thanks! The ornaments I found were not in the holiday items at my Hobby Lobby. I found these about 2 weeks ago and they were near the containers. Hope you can find them! This is an adorable craft and so original. Can’t wait to try it out. These are way too cute! My daughter choose these for her class. I went to hobby lobby and they had everything but the gum balls . Was it tricky getting the globes totally full instead of half full? Can’t wait to make these for my daughters class. Thank you for the inspiration. Hi, Carol! That is so neat!!! The gumballs that I found are from Walmart and you can also find them at Toys R Us, The balls were easy to fill. I just put half in one side and half in the other and snapped them shut. Sometimes I had to take a few of the gumballs out if it didn’t shut, but it was much like filling an easter egg. Just remember to put a little clear tape on the seam so that they don’t snap open in transport! I hope everyone in her class loves them!!! Wow! 90 would be a bit much! 🙂 Thanks for stopping by! Oh my word! These are adorable!!! Thanks for sharing your thoughts on pegasus hobbies. These are SO cute! I’m going to share this post!!! Super crafty! Approximately how many gumballs fit in each machine? Thanks!!!!! These are super cute. I don’t remember for sure, but I would say around 25 each of the mini bubblegum balls. That’s so weird. It’s not a gumball machine at all. you should make a nobby thing to turn on it not just cracking the ornament open. cool idea though. I’m gonna make mine way better. ): ): ): ): ): ): ): Ha! Ha!